"Sinn 104 A St Sa"
Verified Owner Comments: This was my first purchase of a Sinn watch and my first experience with WatchBuys. The experience could not have been better, from the personal phone call the first morning after I ordered to confirm, to the quick delivery, and of course an outstanding product. I will use these folks again for my German watch purchases. Simply the best. I recently purchased this watch and I cannot be more pleased. First of all with the watch itself, it is everything that I had hoped it would be, and has lived up to the very positive online reviews. Second is my experience with the good folks at WatchBuys. Right after ordering, I received a phone call verifying my address and delivery. This is most likely standard for first time buyers, but great customer service none the less. I will be buying from these folks again! Verified Owner Comments: I must’ve looked at all sorts of divers and Fliegers, but I kept coming back to the Sinn 104. This watch fills the bill, offering everything I want in a watch that will last me a lifetime and at a great price. Dealing with WatchBuys was very nice. I spoke with a rep before making my purchase and then got a follow up call to make sure all my ducks were in a row. I can’t say enough positives about the whole watch buying experience through WatchBuys. Verified Owner Comments: There is nothing I can see wrong with this watch, It's easier to read than my Explorer and it's beautiful. Onething to note. Crown will not move to the third stage to set the time 9pm and 3am. It seems to lock to protect the day date complication while the day turns over. At least what a watchmaker told me. This is not a defect but an added protection. Verified Owner Comments: Classic design never goes out of fashion. Great craftsmanship is a thing to behold. This watch is very satisfying to look at and to ware. It looks like pride in design and construction. I take pride in wearing it. "More than just a working stiff"
"Out of this world clarity"
Verified Owner Comments: First of all, Watchbuys service was great. As a first time buyer, I received a call from customer service confirming my order. Watch arrived quickly and was packaged perfectly. The Sinn 104 is breathtaking. I wanted a great non-flashy everyday watch and got so much more! The first thing I noticed was the amazing high definition clarity of the crystal. The hands and markings are so razor sharp! LOVe the Sinn. Verified Owner Comments: Less can be (and many times is) more! I wanted a watch that wasn't ostentatious. I wanted that watch to be capable of being worn in a variety of situations w/o being inappropriate. Versatile, in other words. Casually competent comes to mind! I've found the Sinn 104a st sa easily fits in so well, in so many instances, it's merit is (perhaps) deceptive. It's the kind of watch that, for the $, represents a very good value too IMHO! Easy to make friends with, at the end of the day! All good! The experience at WBs was pretty much the same as the watch, when all is said and done. Hard to go wrong here! I wouldn't hesitate to buy from these guys again! Verified Owner Comments: I sold an Omega PO with the intention of getting something less blingy and the 104 A seemed to fit the bill. I can safely say that I have no regrets whatsoever. The Sinn surpasses my every expectation and I really don't even miss my PO. The numerals make the dial impressively legible. While the lume is not quite as bright as my Helson Sharkdiver or Seiko Turtle, it gets the job done and remains legible all through the night, which was a pleasant surprise. I bought the 104 on leather with the intention of putting it on a NATO, where it looks like absolute perfection. Thanks WatchBuys for the fast service! This will not be my only purchase. Verified Owner Comments: This is the first watch I got that is over a $1000 bracket. I thought I should get a Swiss watch, but after a thorough research, I realized Sinn 104 is even a better choice! WatchBuys had a fast response to my purchase and the watch arrived within 2 days of purchase. I could get it for about $200 cheaper before paying import taxes on grey market, but for such an elegant watch, I thought it’s worth the extra pay, knowing WatchBuys is the authorized Sinn distributor in US. Verified Owner Comments: Fantastic watch. I purchased the 104 A as a knockaround, EDC watch that I won’t have to worry about exposing to a bit of work. It fits the bill perfectly. It wears very comfortably, looks fantastic, is easy to read at a glance, has great lume, keeps excellent time and has twice the water resistance of my Rolex OP. It just does everything well. The leather strap is beautiful and of excellent quality. I currently have this watch on a Marine Nationale strap, as I do a bit of splashing around in my daily life and wish to preserve the terrific leather strap for now. The bidirectional countdown bezel has already proven its usefulness - for cooking, which sadly is about as close as I will ever come to piloting an aircraft. I look forward to enjoying this watch for many years. The purchasing experience from WatchBuys was outstanding, and I would not hesitate to buy from these fellers again. Communication, consideration and attention to detail were above and beyond expectations. "Beautiful watch and great service"
Verified Owner Comments: You cannot beat the quality of this watch for its price point. Very easy to match with everyday clothes. I find myself looking for things to time with the countdown bezel all day. The Arabic numbers make it very easy to read at a glance, the syringe hands make allow very very accurate readings, and the lume is also very bright. Overall 5/5 watch for me. 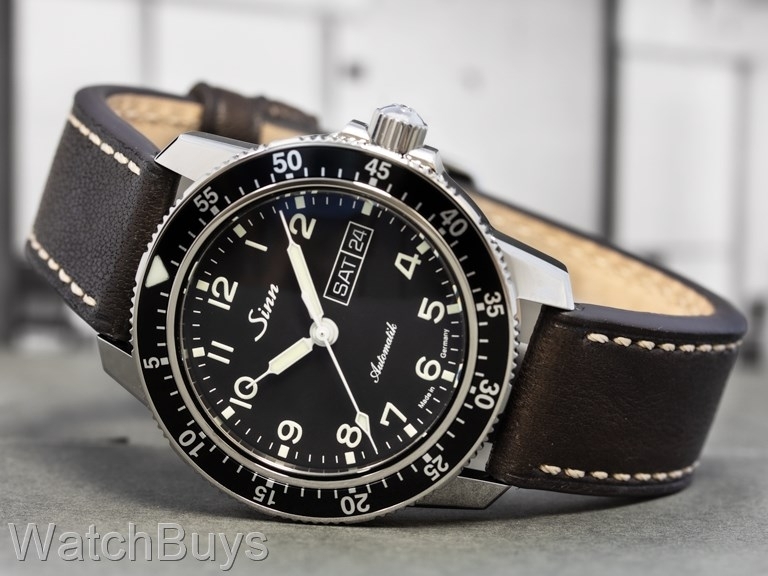 Verified Owner Comments: The Sinn 104 A St Sa is stunning in person. Pictures do not do it justice. Keeps excellent time (it has gained 8 seconds over a week and a half). Awesome customer service and lightning fast shipping. Looking forward to my next purchase with Watchbuys! Verified Owner Comments: Decided I wanted to get a nice automatic watch a few months back to compliment my current quartz watch so started researching what was out there in the $1k-$2k range and settled on the 104 A with leather strap. Have had it for a couple weeks now and love it!! Many thanks to Kevin & Matt for answering my questions and helping me through the process of putting together the perfect watch that I was looking for. Verified Owner Comments: I had been eyeballing this watch for a few months, and finally decided to make the purchase. Extremely happy with it. The polished steel case is slick — the online pics don’t really do it justice. The watch feels well-built, and is now my everyday casual go-to option. The case size is just right for my 7” wrist, although I am on the tightest strap hole, so those with smaller wrists may need to purchase a shorter after-market strap. If I had to nitpick, I would say that the lume, while bright, does not last very long. Other than that, this is a perfect pilot-style casual watch. WatchBuys transaction was very professional and fast. They had the watch in my hands within 24 hours (with expedited shipping). I would definitely order from them again. Verified Owner Comments: Everything I hoped for - great size, great aesthetics, great functionality. "Top-notch service for a top-notch watch!" 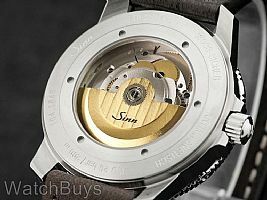 Verified Owner Comments: I am completely smitten with my Sinn 104 that I purchased from WatchBuys. I had my new watch within a week, so 10/10 for WatchBuys for terrific service. The watch itself is everything I had hoped for: beautiful design, very high quality - can't say enough about it! I would highly recommend both Sinn and WatchBuys in the future! "First Mechanical Watch - From A Longtime Quartz User"
Verified Owner Comments: I ware this watch everyday. It fits me perfectly. I ware it when I go to work, to play sports or dress up. 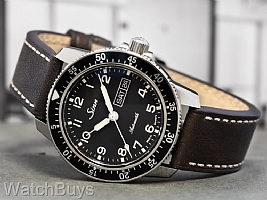 Verified Owner Comments: The Sinn 104A is an amazing watch. I compared it to most of the other Sinns at a recent WatchBuys road show and it came out on top for me as the most versatile. The proportions of the watch are spot on (weight, thickness, and diameter), and it is an incredible combination of classy and rugged. I’ve worn it to a black-tie wedding in addition to wearing it with shorts and t-shirts. It’s my everyday watch and I rarely take it off. I wear it mostly on a green or black NATO strap and it has a sophisticated field watch military aesthetic with the Arabic numerals. There is a very clean and crisp contrast the white hands and numerals and the deep black dial that is very visually appealing. It is extremely accurate – I am getting less than +2 seconds per day. The lume is also excellent. I highly recommend picking one up. The road show and overall purchase experience were great too. Verified Owner Comments: If you can get Rob on the phone he will answer all your questions and make sure your are comfortable with the entire process. Thanks Rob for your dedication. I prefer the Arabic numerals. Also I purchased the deployment buckle but personally the watch and strap wear better on the tang buckle. What can I say guys the watch far exceeded my expectations. I wear it to work and then with shorts to watch a game with buddies. I appreciate the craftsmanship and the price was very reasonable. Would love a sinn 104 a st sa on the new limited edition blue dial. It has kept time since the day it arrived. Been wearing the watch for a month and am very happy. Would buy another sinn. Thanks again Rob in customer service.